Community microgrids are central pillars of today’s local energy revolution. Being developed in municipalities large and small, they are a key feature of the new clean and efficient electrical infrastructure that is beginning to transform America’s energy grid into a less centralized and more democratized entity. Mayors and city leaders are especially tuned into this transformation because of the severe stress that extended power outages create in their communities — from inconveniences that prevent people from completing day-to-day tasks to true threats to health and well-being. Community microgrids, offer towns and cities a way to keep the lights on even when the central grid fails, and provide basic services to the citizenry. Power outages are one reason that mayors and municipal leaders seek ways to bring energy production closer to home with microgrids. But the value of the community microgrid goes deeper; a microgrid may not only deter economic calamity, but also can enhance community prosperity. Community microgrids help draw coveted high tech industries to cities and towns by offering the reliable, premium power and cleaner energy services that these businesses require. In addition, many communities are seeking proven approaches to address climate adaptation; reduce greenhouse gas emissions; and invest in cleaner, more sustainable energy systems. Across the globe, cities large and small are taking initiative to tap local energy resources and build energy infrastructure that will expand their tax base, diversify energy supplies and address the need for expanded services for denser urban populations. Cities are seeing dramatic population growth along with a need for energy master planning and integrated energy systems that optimize efficiency and reduce waste. While towns and cities show increasing interest in community microgrids — and several have projects under development — little easily accessible guidance exists for municipal leaders who are exploring the concept. 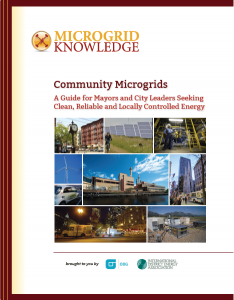 To help these communities get started, Microgrid Knowledge has produced this report.